You’re doing everything you’re supposed to do. You’re writing posts readers seem to enjoy. Your traffic is increasing. A popular blogger has noticed you and tweeted one of your posts. You’re putting in the time day after day and week after week to make your blog successful. And, little by little, you’re seeing results. So why do you feel empty? Why is apathy overtaking you and your blog? Why did the joy you felt from blogging just a few weeks or months ago dissipate? Where did your enthusiasm go? It’s not supposed to feel this way. Right? There are many reasons blogs fail. Some bloggers set unrealistic expectations for themselves. Some are lazy and don’t put forth the necessary work. Some just aren’t good at it. However, it’s my belief most blogs fail due to lack of direction and purpose. And without these, a blogger is doomed. Author Donald S. Whitney once wrote of a six-year-old boy named Kevin, who was taking guitar lessons. Though initially he was excited about guitar lessons, lately Kevin wished he was outside playing baseball with his friends. Strumming “Home on the Range” on his guitar day after day long ago lost its appeal to Kevin. Then an angel appeared before him. He showed Kevin a vision. The angel showed him a man playing beautiful music at Carnegie Hall. “Wow,” is the only word young Kevin could utter. Kevin now had direction. He had a goal. He had a purpose. Before the angel’s visit, did young Kevin have discipline? Sure. He was practicing his guitar every day. He may have been doing it reluctantly, but he was doing it. But here’s the thing: discipline without direction is drudgery. It’s not fun. It’s not joyful. It’s a chore. And, eventually, drudgery chokes the life out of discipline. Do you see a problem with this goal? You should. Belting two notes of a random song accomplishes this goal. Having a long musical career culminating in induction to the Rock and Roll Hall of Fame accomplishes the goal, too. An unspecific goal is a goal which leads the holder of it to a path filled with disillusionment and failure. Let me tell you a story about a different Kevin. I started blogging in 2005, and by 2006 I had a growing and thriving blog. I didn’t realize (or appreciate) it at the time, but it was quite successful. It was a featured blog on AllTop’s homepage. The traffic was impressive. I even received multiple marriage proposal emails from female readers. I wanted the blog to be “really popular,” and I worked hard to make this unspecific goal a reality. I tweaked and perfected my blog design until it was just right. I wrote several posts a week. My writing kept getting better and better. It worked. My blog became “popular.” And I enjoyed the fruits of my labor… for about one week. When you don’t have a clear direction for your blog, you eventually lose interest. That’s what happened to me. Even though my blog was popular, writing for it soon began to feel like a chore. Once my “goal” was met, I should have started a new one. I should have aimed for bigger and better things. But I didn’t. And because of this I missed out on some golden opportunities. I never monetized my blog. I failed to leverage my blog’s popularity into Twitter, Google Plus, or Facebook followers. I never started a mailing list. I never responded to the marriage proposals sent to me by Leelee Sobieski and Rachael Leigh Cook. That last one doesn’t bother me because I married someone a million times better, but those other lost opportunities haunt me. Why Are You Really Blogging? Your reasons for blogging need to be crystal clear. Your goals need to be specific. Goals give you direction. They give purpose to your actions. Without purpose, you’re just going through the motions. Six-year-old Kevin in the story likely would have quit guitar lessons had the angel never visited him. There is only so long before drudgery defeats discipline. But after seeing his future, Kevin had a clear goal in mind. From that point forward, his guitar lessons had a purpose. He was no longer simply “learning to play the guitar.” He was taking steps towards Carnegie Hall. I wish I knew then what I know today. Today, my goal is to blog for a living so I can work from home and spend more time with my wife. My former blog could have accomplished this goal – if I had bothered to define it as one. Would I still have had down days? Days where I didn’t feel like blogging? Of course. But those days would never have overtaken me. Not as long as kept my goal in mind. What is Your Carnegie Hall? Having clearly-defined goals will give meaning to every action you take with your blog. Every comment you make, every tweet you send, and every blog post you write will have a purpose. Whatever goal you make, make it specific. Tell it to a friend. Write it down. And if you reach your goal, for goodness sake, make a new one. Don’t make the same mistake I made. Discipline, when combined with direction, is an unstoppable force. The alternative is drudgery, and a blog which will one day be abandoned and forgotten, like so many blogs before it. But that’s not going to happen to you and your blog. Creative Commons Image via Lloyd Morgan (adapted). You said our most recent posts followed on from one another and you wern’t wrong! Why do blogs fail??? It’s the passion that’s missing. The drive, the knowing WHY behind you are doing what you are doing. When you started your first blog, you knew that you wanted a successful blog, but you had nothing behind you moving it forward and nothing necessarily driving you. You need to have a constant replay in your head of why you are doing what your doing, and that needs to be stronger than ANYTHING else going on! I have had lots of comments to my recent post about ‘what is the why behind your blogging’. People have answered, because I want to make an online income; because I want to share my views; because I enjoy it! These are great answers, but they don’t actually answer the question. That question is WHY! If you have an absolute, never faulting, nothing can move the “why” behind what your doing, then you will succeed. Maybe not today and maybe not tomorrow, but it will happen. The why has to be bigger and more important than anything else to keep that passion, drive and commitment alive. It’s 1am here, and I know I should go to bed….my daughter will be up in 6 hours….but I am not yet done for the night. My WHY is way to strong to give up for a bit of extra sleep! No doubt, my first blog would have succeeded if I’d had a “why.” I wanted it to be successful, but I didn’t have a tangible reason for WHY I wanted it to be. 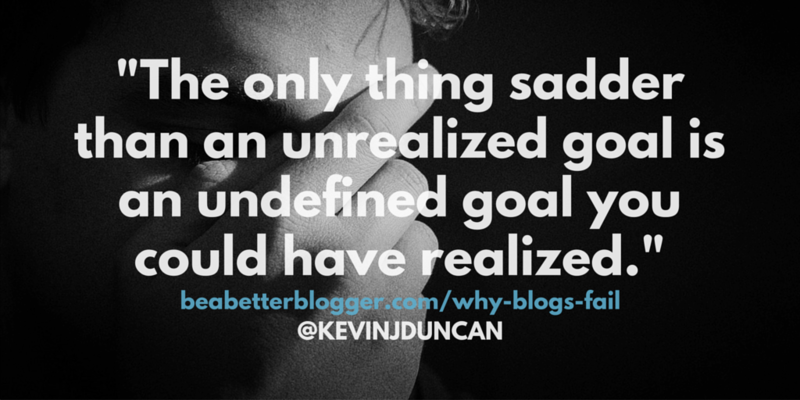 It was simply a superficial goal I set for myself. It sounds as though our whys are similar. We both want to be able to work from home. That’s an excellent why. When we’re tired, when we don’t feel like writing or comment, when we getting down… we can cling to our ultimate goal. And they’re not superficial goals. They’re tangible ones. Glad you enjoyed my post, Catherine. I certainly enjoyed yours. If someone drive car safely and without any violation of traffic mistakes he can be called a good driver. But we can’t call him a successful driver if he does not drive his car in right direction to reach the destination. A blogger can also be called a good blogger if he publishes good contents, attract huge number of visitors, buy whatever he can at his blog and even make money. But what next he does not know. If he achieves all these goals without any purpose he will stand still there and will simply keep earning a few hundred dollars forver. If he doesn’t have strategic objectives he can not become a successful blogger. My main goal of blogging is to eastablish my authority as money blogging consultant and achieve professional excellence both in offline and online world. For that reason I do have short term goals of money making but all my activities and mini goals contribute to help me achieve my strategic blogging goals. Thanks a lot for sharing another wonderful post that really much and frequently needed to let newbie bloggers main reasons of blog failures. Good to see you again! Thank you for stopping by and leaving me your comment. Having short-term goals in addition to your strategic (long-term) blogging goals is a great suggestion. That’s really how we should treat everything in life. Have short goals AND long goals. You’re always striving towards something, but you’re also giving yourself “small victories” to boost your spirits. Glad you enjoyed it, Mi Muba. Thanks for your comment, and hope you have a great Thursday. What you’re saying is very true. In terms of goals, you have to set them and then as you’re close to reaching those goals, you have to start setting other goals to reach. When I started out my blog, my goal was to make money and be rich. And in a way it still is , but my reasons for wanting to do that changed drastically. Back then, I wanted it just because. But now, I want that so I can not only spend quality time with my family but be in a position where they don’t have to struggle through the commute to get to work everyday. But the one thing that you said that I’ve been doing from ever since I read that book, “Think and Grow Rich” is I write down my goals and look at it everyday as a constant reminder or why I’m doing what I’m doing and what I’m setting out to achieve. Really good stuff here, Kevin. “Back then I wanted it just because.” Yep. Exactly. That’s how it was for me. And “just because” is a strong enough reason to do…well, anything. It’s certainly not going to help you get through days when you feel like quitting. Definitely. Writing down your goals and putting it somewhere you see it every day is a great tip. I’m going to write down my goal and put it on my monitor. Then I’m looking at it 8 hours a day! Appreciate it, Andrew. Thanks for the comment. Hope you have an awesome weekend, too! I hear it quite often – blogging doesn’t work. So people give up. But when I probe a little deeper, then I find people don’t have a direction for their blog. They don’t know who they’re writing for. They don’t know how they want to help their readers. They don’t have an email strategy in place. And they don’t know how they can make money from their blog (assuming it’s not just a personal journal). It’s no wonder so many blogs fail. It’s sad how many bloggers quit due to lack of direction or purpose. It took me way, way too long to realize I needed to treat my blogging as a business. Because guess what? If you want to make money… if you want to be able to quit your day job… your blog is a business! Thanks for your great comment, Henneke. You are so right. I will tell you, I blog to connect, learn and improve my business relationship skills. I’m a fantastic offline networker and I make a great living as a result. But knowing how good I am there how much better could I be online since the principles are the same. I blog not because I get much business from a 3 month old blog right now. I would love to get more but I’m also in the marathon and not the windsprint. I’m still building that community of raving fans that I know one day will tip the scales. However, my offline world that comes to my website and sees what’s going on has earned me many many consulting and coaching opportunities with companies of all sizes. So, there can be an offline component to building your online community. I chose to wait till the end to tell you my real goal and that’s to help businesses owners and entrepreneurs learn to stop thinking like employees and giving themselves jobs in their own companies. I want them to connect more meaningfully and purposefully with their business so that they can run their business and it not run them. Do I build websites? Yes. But I do it as a means to meet business owners who I know I can help make a real difference in their world. I hope you’ll take a few minutes Kevin and read my post today. You’ll see a full page testimonial that hits at the very nature of what I do; and it’s amazing!!!! Great post Kevin. You nailed it and I love it!!!! Exactly. You’re building that community (and doing a great job of it), and I’m trying to do the same. Your blog, mine and Ryan’s were started around the same time (3 months or less). We’ve each come a long way so far, but as you said it’s a marathon, not a sprint. Your post today (yesterday now) was great. And thanks, again, for the kind mention. Your goal is clearly defined (as evidenced by the blog post, as well as the daily actions you’ve been taking), and it’s why you’re succeeding! Hope you have a great weekend, too, Don. And thanks again! I’m actually developing a strategy right now to meet business bloggers and journalists as well as speakers. I figured out a long time ago that in order to keep from failing we first must offer the appearance of success. My community is absolutely amazing and I can’t wait to introduce all of you to other people that I will meet along the way who will help us all!!!! That sounds awesome! It should be a given, but let me know whenever I can be of help. A Tweet, a G+ share, a mention… just let me know. This blog is fairly new to me. Welcome to my blog! I’m glad you stopped by. Encouraging others is a wonderful goal. How’s it going for you so far? Thanks for commenting, Bob. Hope to see you again! It seems like all the blog posts I have read this week are pointing me in the same (IMPORTANT) direction. Lately I’ve been moving in so many different directions, but I’ve felt so lost because I’m chasing too many goals at the same time. I’ve been too scared to set a major priority because I feel like I’m too far down the road to let any of the pieces go, but I know I need to do that… I just can’t quite figure out what needs to stay and what needs to go! I gave up on my original blog six years ago and I often wish I’d kept it up, so I definitely want to keep blogging, but… I don’t know. Stumped. So you’ve read multiple this weeks along these same lines? I know Catherine wrote a post this week which could almost be a follow up to this one (even though hers was published two days earlier)! Believe me, I know the feeling. In many ways, I’m thankful for the failure of my first blog because it made my vision for THIS blog crystal clear. The domain name, how it would look, how I would write, etc were all finalized in my mind before I began. Things have evolved a bit in three short months, but the primary vision and purpose remains. To me, your “Mommy Blogger Academy” seems well thought out. From the domain name alone, I know what your blog is about and who your target audience is. That’s huge. Few domain names can accomplish such feats. Email me if you ever need a sounding board. I’d be glad to listen and offer my two cents, if I have worthwhile feedback. Hope you have a great weekend, Brittany. Thanks again for stopping by. I’d like to step in and make a small suggestion in the way we think about this…. You have both (Kevin and Brittany) arrived at this point in time because of what you’ve experienced. I tell my kids there is no “good” and “bad” experience, only experience. What we do with it is the point. No, I didn’t. I gained experience the Universe granted me, so I could use it at a later date. Now I’m able to completely run a publishing company from top to bottom, design websites, podcast, shoot video, design graphics…you name it. All because I was tossed from job to job, which didn’t last—BUT I walked away with more skills, more knowledge. Kevin pointed out specifically that he could have made a living with his first blog…but have you forgotten what you did? No–you just said it helped make the focus of THIS blog crystal clear. Brittany, in teaching kids, I tell them in ‘Advanced WORLDBUILDING’ to start with the end in mind. It’s easier to create stories because when you have the ending in place and you know what you want readers to experience, the steps reveal themselves. The creative process is faster, smoother and natural. …may I suggest that you’re looking at things backwards, by looking at them from the front? IF you were to discover what you REALLY want, the priority list and parts would reveal themselves. I used to make $29,000 a month blogging for a National Company. I know–crazy, but I did. Lasted 4 months and I was a writing machine. I was the paid $8,000/mo. for 90 minutes of work a month to maintain what I was created, which lasted a little over a year. Haven’t done it for myself, yet with Wantedhero.com, and I’m in a very different industry–BUT I know that I’ll exceed what I’ve ever done before. That’s what is important. I know it’s a matter of WHEN, not IF. I’ve been on and read both your blogs. Trust me, it’s only a matter of WHEN, not IF…for both of you. Sorry for preaching. I just see a lot of talent in you Brittany…so don’t talk silly. You are absolutely right in all that you wrote, the very reason why blogs fail. I think opening a blog is the easiest part, but to carry on blogging consistently isn’t everyone’s cup of tea. Most bloggers, especially the new ones, as I see, start with lots of enthusiasm and go all out, though when their expectations aren’t met – they give up as fast as they started off! There is lack of patience in them as well, and most of them just have the sole aim of making fast money. I guess they don’t realize that Rome was not build in a day! I didn’t know you had a blog earlier, and I loved those lines about the marriage proposal too! I guess certain things aren’t meant to be, and perhaps that’s what turned you to where you are today, seeing the brighter side of it all. However, I feel one cannot achieve it all because of the limited time we have in hand. Well, my aim’s somehow never been to make money through my blog, though my goal and purpose is well defined, which is to help people in whatever way I can, through my blog and writing. To inspire and motivate them, help them reach higher levels, solve their problems to the best of my abilities, promote the needy bloggers, and just go all out. Why? Because I remember my time when I started out, and there was just NO one I know from the blogosphere, so I cannot forget those times and I know what newcomers go through. Moreover, I strongly feel that as bloggers, this is the least we can do, isn’t it? Yes, I don’t earn from my blog, not as much as the efforts I put into it, which I hope to change, without changing my main aim and purpose, as I mentioned above. If things can work along with it, nothing like it. Thanks! I couldn’t agree more. Starting a blog is the easy part, it’s carrying on with consistency which is difficult. Lack of patience and unrealistic expectations are common thorns. Oh yes, I had a blog earlier. Since you’re Enstine’s featured blogger this week, you should go check the feature he did on me several weeks back. It’ll tell you a bit of my backstory, including my former blog (which was a humor blog, of all things). Your goals, to inspire and motivate bloggers, are wonderful. And it’s clear to anyone who visits your blog you are reaching those goals! Well done. Hope you have a nice weekend, too, Harleena. Talk to you again soon, I’m sure. I must write my goal down. I know when you either speak it – tell others or write it down it becomes more real and you feel obligated to reach that goal. It may even inspire yourself to do that and have a plan in place to do so. Without that plan you don’t know where you are going and are wandering aimlessly around to just get more traffic to your blog. It’s like that with anything else in life too. Many people just respond to things around them and never are the cause for change. If we want change in our life, we must produce it ourselves and not wait for others to do it for us, it may not be the change we really want. Thanks Kevin for this reminder and inspiration, have a wonderful weekend! Welcome back to the blog! Good to see you again. Definitely. Writing a goal down, speaking it, telling it to others… anything to make yourself feel obligated is a great trick. It’s amazingly effective, I’ve found. Agreed! Too many people sit on their hands and wait for good things to happen. Want change? Produce change! Thanks for stopping by and commenting, Lisa. Hope you have a wonderful weekend, too! I agree with you that lack of purpose and direction is a big reason why blogs fail. I’d also say that it is a big reason why moderately successful blogs aren’t more successful. I’ve been working online, mostly blogging, for almost 6 years and I can say that during some of that time I have kind of coasted by without all that much direction. I had goals and things I was working towards, but looking back I didn’t have as clear of a picture as I should have. In some situations my goals and my approaches were a little scattered. One of the things I am starting to work on now is to get more simplicity in my business and my websites. Having just one main goal or purpose with each site and making it more clear to visitors by removing distractions. That’s a great point. There are lots of moderately successful blogs out there which could have become MONSTER-sized blogs of influence if they’d had proper direction and purpose. It happens in sports, too. How many top NFL and NBA draft picks flame out or have mediocre careers? Too many to count. They feel like they “made it” and stop working hard. In reality, their work had just begun. Once you’ve made it, it’s time to REALLY get down to work! Great plan on keeping things simple with your businesses and websites. I’m trying to do the same (“have just one main goal or purpose”). Thanks for the comment, Marc. Hope you have an awesome weekend! Welcome to my blog! I’m glad you stopped by and left me your comment. Agreed, too many people get into blogging as a quick way to get rich, but that’s just not how it’s done. I’m glad you enjoyed the post. Thanks for commenting! Have a wonderful weekend, Victor. I used to have over 50 blogs/websites. But I soon stopped adding content to them, simply because I lost interest in them. I now concentrate on just 1 blog – my personal blog. I write about anything and everything that interests me. It’s only a few weeks old, but I feel like a weight has lifted from my shoulders and I have a new found love of blogging again. My ‘why’ is because I enjoy life and want to better myself. I want to share that with other people, and hopefully they’ll feel the same. Welcome to my blog! I know you commented on my 8,317-word post a few minutes before commenting on this one, but since I’m replying to this post first I wanted to make sure I welcomed you. Wow, you used to run over 50 blogs/websites? I can’t even imagine the time commitment. Good plan to concentrate on just 1 blog now. You should find it much easier to remain inspired! Wonderful to hear you’ve found your love of blogging again. I hope your new blog has tremendous success! Good luck with it. When I first started my travel blog I had no idea what my niche would be, what my voice was, or what I really wanted my message to be. My goal, when I quit my job 5 months ago, was to be 100% location independent within 1 year, but I wasn’t sure which direction I should go in to get there. I started paying attention to the posts I was writing – what felt like a chore to write and what seemed to flow out of me. I started writing down phrases and overarching themes that kept popping up until I knew what it was that I really wanted to say. From there, I wrote out a mission statement. Now, I’m thinking about re-branding (eek) in order to better reflect that, but instead of feeling daunted or discouraged I feel re-energized because I know I have a purpose. Glad you liked the post! I visited your blog and, wow, you really did quit the rat race, didn’t you? That’s awesome. My wife read a few of your posts before I did, and she said you were really interesting. She’s right. You have a very entertaining voice, which comes through in your writing! Thanks again for visiting. I hope you’ll come back soon! Have an awesome weekend, Mandie. How very true! Lack of direction and purpose is spot on as a reason for failure, and I think too that folks don’t narrow in on a small enough target audience. When you try to appeal to everyone, you don’t hit the mark very well, in my opinion. Ouch! No list building or monetization on your first blog? Then, to me personally, I don’t describe a success as just traffic and being recognized … But there are many different types of success. Yes, my goal is to continue growing as an Online Entrepreneur and continue growing my income for freedom of time and space… (for family). Absolutely! Discipline and direction! Yes! Keeping the why in front of me, why I do what I do is critical for me to have the drive needed to be consistent with working toward my goals. This was an awesome post, Kevin, and made me dig in a little deeper to fix my purpose and goals in my head and heart. It’s an encouragement for sure! Nope, no list building or monetization on my circa-2005 blog. Back then it was all about RSS subscribers (remember those days? ), but in truth I didn’t even concentrate on RSS back then! I just wrote, and wrote, and wrote. “Popularity” was my goal, and it’s a very finicky goal! Thanks again for another great comment, Carol. Hope you have a great day! I would say you should set small goals in the start. Such as getting more than 10 views daily, getting 3 comments in 3 days etc. Because they are easy to achieve.So that you can see yourself moving towards your goal. Welcome back. I haven’t seen you here in a while! Setting small goals in the beginning is great advice. “Baby steps,” as I like to call them, keep you on the path to meeting BIGGER goals. Glad you enjoyed the post, YF. Hope you have a great day! Yeah, I was just busy doing things. Hope to get back properly very soon. You’re right about the whole direction thing and goals can help any blog go a certain direction. It’s interesting actually, because when I started the Smart Income Detective Blog in January 2013, I started commenting on blogs I liked at that time. When I like a site, I bookmark it in Chrome. I would say from those initial bookmarks, about 80% of those blogs I commented on are either no longer online or are no longer updated. People write a couple of posts, pepper their blog with adverts, and expect instant success. In fact, there is a sub forum of a forum I visit every now and again. It’s a sort of ‘check out my new site and tell me what you think’ kind of sub forum. Click on any link there, and you are taken to a blog which has absolutely no content, but already has all the ads in the sidebar. Completely the wrong way to go. Anyway, just to let you know – this post has made me look at some of my own goals and the direction I am headed in. Wow. I know I shouldn’t be surprised to read 80% of the blogs you bookmarked back in January 2013 are either offline or no longer updated, but it’s still surprising whenever you see those kinds of numbers. There are lots of bloggers who make money, but my guess is 99.9% of them are offering value (of some sort) to their readers/customers. As you said, having a blog with no content, but having sidebars filled with ads is absolutely the wrong way to go. Glad you got something out of the post, Richard! Hope you have a great day. Millions of blogs get setup every year but few of them live for long time becasue due to some unexpected reasons. It’s always asked to newbies as why they want to build their blog? What’s the reason they are working so hard to make their blog alive? But few of give proper answer because most of them don’t have their clear vision regarding their blog. I have talked with two beginners who answered that they want to make money as his friend is making thousands of dollars. I mean how can they stick to blogging just by knowing that their friend is earning much? There are many other reasons for the failure of blog which can turned in havoc for any blog. You’re right. Those two beginner bloggers you talked to are likely going to be disappointed. If someone asks you why you want to blog and you respond with “because my friend makes thousands of dollars blogging,” you’re probably not going to make it. I hope they reevaluate their goals before it’s too late! Thanks for stopping by, Ravi. Hope you have a great day! It’s my first visit to your blog and i would simply say; you rocked. I was in the same situation as you were, my blog seemed successful but it didn’t complete my mission of setting up a reliable online business. That’s why i switched to a new blog and i’m working pretty hard to convert my business into one of the best online businesses. Thank you very much! I’m glad you liked the post. So you were in a similar situation? I’m sure you learned a lot from your prior experience (just like I learned from mine). Are things going better for you at your new blog? How long ago did your new blog go live? I visited a few minutes ago, and I really like your blog design. Very nice. Keep working hard! Our goals are obtainable, if we keep working to reach them. Thanks again for stopping by, Siraj. Hope you have a great day! This was a great read, thank you. My immediate goal is to figure out my direction then go from there. My blog started off in the ‘travel’ arena as I am a military spouse who travels frequently for my own career, then spun off into multiple directions. It feels a bit random and I’m working on remedying this. I am monetizing (little by little) and my goals will continue to evolve as I learn and become a better blogger. When I started out there was no intention to make money at it. Yet here I am. Look forward to reading and learning more from you. Welcome to my blog! And thank you for subscribing (and letting me know). That’s awesome. I checked out your blog just now and… love, love, love the logo/header. Very well done. Appreciate you stopping by and subscribing, Heather. Looking forward to seeing more of you here on the blog! Have a great day. This is an excellent topic and one that near and dear to me. I think that one of the most valuable assets we have is our mindset. The best hosting, theme, plugins and so on can not bring all these things together and make it successful. As you mentioned I think being realistic is another thing that hurts a lot of others. When I first started trying to blog years ago, I thought it would be easy to write post and make some money from it. Was I wrong. I dove in much to fast and didn’t take the necessary steps to prepare myself for what it really takes to make it successful. Just as a rule of thumb, many of the really popular blog owners said they were or still putting 16 hours a day into their blogs. For me I am nowhere near that. I know I will get there but it will be a steady climb for me for sure. Excellent post and points that I think everyone should consider before and during their blogging journey. Have a good rest of the weekend Kevin. Yeah, I think we all have that “this will be easy” mindset until we actually get into it. Then we realize how difficult it is to be a successful blogger, how much time it takes, etc. Thanks for another awesome comment, Steven. Hope you have a great day! This post totally hit a nerve with me because I’ve been in the exact same position as you were with your earlier blog. When success came, it felt like I was flailing around in a vast ocean with no land in sight – no direction, which is the essence of what you’re talking about. Without that spark, that love of what we’re doing and manageable, realistic goals in place for us to aim for, that success is difficult to hold on to. I’ll certainly be keeping your advice in mind as I move forward with my current site. Ah, so you can relate? You’re absolutely correct. Without tangible, realistic goals in place (beyond “be popular”), holding on to success is difficult. Heck, maintaining interest in your blog is difficult. Glad you stopped by, Stacey. Hope to see you here again! Good luck. Yep Kev, this is what bother me from time to time. What is a real reason for me to blogging? I say that is just to speak out my voice to the world. But, sometimes i also want some money from this blog. I think, my purpose on blogging is still unclear, isn’t it? Anyway, thanks for the question Kev, it made me thinking. Good to see you again. It’s not the end of the world if you’re still unclear with your blogging purpose. It just means you need to take some time and sort things out. Why can’t your purpose be two-fold: Speaking your thoughts and making a little money? It can be done, if you find a plan which works for you. Welcome back. I’m glad you enjoyed the post and learned something from it! I’m glad to hear you are passionate about blogging. Loving to blog… being passionate about it… certainly helps! I hope this post and my others help you on your journey. Hope you have a great day, Moumita! I couldn’t agree more with everything you’ve said – you’re spot on! And it’s SO important to have a vision we are truly passionate about. Something that excites us enough to take action day in, day out. If not, just like Kevin the first time round, we’ll soon get bored. I’m a Gemini, so it’s in my nature to get bored very easily! Apart from singing/song writing, working online is the ONLY other thing in life that I’m truly passionate about. Yes, money is needed to achieve our goals, but like you’ve clearly stated in your post, it’s NOT enough. Our reasons need to be way deeper than that! What a great experience you have shared with us. I do agree that bloggers need direction if they are serious with their blog. If not? It will be just another hobby. This is also happen to me back then. I’ll do my best to overcome the problem until I finally found my “direction” back through monthly report and several project. I like challenge to find real proof that people can follow and get the best result. This is the direction that bring me joy to blog. It’s good so far to me. Well I definitely agree that without a clear vision for your blog then failure is just an accident waiting to happen. Saying that we want to make money will only discourage those who haven’t quite figured out how all of this works. I know I became discouraged with my blog over a year into it because my goal for having started it wasn’t quite working out. My niche was way too broad so I wasn’t doing as well as others and I was becoming extremely bored writing about the same old thing. There is just so much you can say about what affiliate marketing is. I never had the desire to give up though and I didn’t even contemplate that my blog could be successful. All I wanted to do was build my business and I was taught that blogging would help with that and it eventually did. I think you have to have the drive and determination to do and be better. I had never considered myself a writer either but boy do I love to help people learn. I especially love helping those who were just like me and had no one to turn too. I think that’s why I started to stand out to so many people because once they realized I was just like they were and they saw how well I was doing then that motivated them that much more to keep moving ahead. Hi Kevin. Amazing story man. I need someone like you to share my purpose in life. I started blogging to earn some serious money. But i am giving primary importance to providing valuable and good content to my readers. I need money to quit my job and lead a happy life with my wife. Currently, i’m not married and i don’t have any girl friend. I took a pledge long time ago, if i have a girl in my life, i will give her all types of enjoyment in the form of love, financial facilities and so on. Now, I could give her love but no financial enjoyment. That why i chose Blogging to earn some money to find my life partner. I really inspired by this point “Discipline, when combined with direction, is an unstoppable force.” Keep sharing this type of posts. This is one of my favorite articles Kevin. Most likely because I’ve been working on a guest post and it caused me to stop and reflect on what my goals were. In short, my own blog was originally created for gaining a greater reach and influence with readers. My long term goal is to make 100 sales a day from my blog–that would allow me to take care of my rather huge family, get our farm up and going and write without having to find other work. The more I focused on my goal, the more it eludes me. The more I focus on other people and NOT on money, the more I make. The other side to that coin is that the more I focus on money, the less happy I become. The more I focus on service, the happier I am. Soooo, the less I focus on the main goal, the closer I get and the happier I am. I was referred to you by Nathan Ambrose. And here’s where I need information, please. Okay, so I’ve read umpteen blogs on how to make money blogging, but none has given specifics on ‘the money generating tactic’. I’ve spent thousands of dollars on ‘blogging techniques’ and I’m still missing the main component for making money just by blogging. Yes, I’ll admit I’ve made money as a freelance blogger by writing for B2B, however, all I did was for their profit as a ghostwriter. The miniscule income I made was shared by the publisher, the client, and the production manager. So, in all earnestness, may I ask, ‘Why in the world are people bragging about making money with blogging?! Please, please, enlighten me! That’s a good question. The answer, as frustrating as it may be, is different from blogger to blogger. Promoting affiliate links through their posts works for a lot of bloggers. If you’re getting lots of traffic, companies may pay you to be the “sponsor” of posts you write. And if you really get lots of traffic, even Google Ads can bring in some dough. However, for most bloggers who bring in an income (big or small) through their blogging, it comes down to digital products. They might sell a book, a course, a plugin, etc., but they have something tangible to offer for a price. And through the posts they write, more eyeballs see the digital product(s) they have to offer. Thanks again for stopping by, Krystalina! Hope to see you here again. I am going to do this exercise but I need an answer. How do I know if the blog I like has “readers”? Do I deduce this from the comments, or is there a specific place I can find out their numbers? We could all do with The Ghost of Christmas Future come visit us in the night.. bit scary but hey.. I was told by a consultant psychiatrist years ago..
“Thwarted ambition is the reason for many peoples depression and anxiety”.. I was a psyche nurse not a client 😉 ‘tho many psyche nurses could be clients to be honest! I have also noticed that many people are afraid of success.. better the devil you know..
Also … working in a job that is ‘ok’.. that you don’t actually hate.. can paralyse you into working towards a dream or goal.. there is a difference between those who have dreams and goals.. and those who actually ‘take action’ as they say… easy to say.. more difficult to follow through..
Another great post! Though I had my purpose, my WHY and my reason for starting a blog, yet posts like yours keeps us “purposeful” bloggers on track. It’s easy to get sidetracked by the “business” side of our “purpose” for blogging, but it is important to keep the main thing, the main thing. My purpose is to reach others with a message of hope, providing purpose for living and leading. Another purpose is to work from home while reaching the world from my office where not easily physically possible to go to, and spend more time with my family. I don’t have a blog but I write regularly on Medium and LinkedIn. I don’t have an email list but I do have an excel spreadsheet of about 500 people that I send curated articles from around the web. These 500 people I have actually met in real life. To inspire others to do the same. Writing helps getting to know more about yourself. Writing helps others understand you. I set a goal for myself. I heard it would take a year to reach it. It took 11 months, which just passed. I don’t know what my new goal should be. Yes, I’d like to monetize it. I guess a monetary goal would do. Where would you recommend I market an Ebook about blogging and social media? Hi Kevin, Mine is working on a more refined niche: Twitter tips. I’ve been doing it for a few months now but I need to write longer posts, work on my eBook and share more of my stuff to reach the 80/20 rule. I keep on getting sidetracked 🙂 I also know I don’t want to be online 24/7 so I have to work smarter with this goal. I’d love a tip on how to accomplish this one. Thanks Kevin and have a great day! This is one of the best blog posts I’ve so far read on your blog, its really thought provoking and i love you for that. Indeed, i see myself making the same mistake you’re talking about here and many other bloggers are also guilty of this without knowing it. Having a goal is not always the problem, the problem is that most of our goals are usually not realistic and defined and thats why many people always give up along the way while blogging. However, this blog post is indeed a wake up call and i will have to print it out. Wow… that’s what I have to start with. I’ve been blogging for 10 years, and at present I have 5 blogs; yeah I know, overkill. Thing is, I really only have a purpose for two of them, and for one of those the purpose probably isn’t the right one. As much as I love blogging I can’t say I’ve been successful generating any income or true interest in any of them, and that’s on me. The goal hasn’t really been set, and you’ve captured a big part of it. Lately I haven’t been as motivated to write 3 of blogs and that’s problematic. Time to sit down and figure out what my goals really are for each of them and then determine if that’s enough. Good stuff!